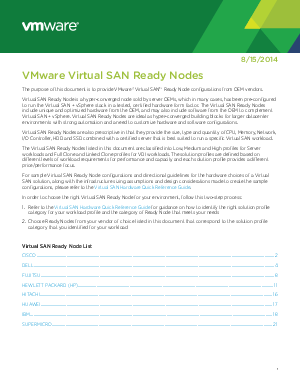 Virtual SAN Ready Node is a hyper-converged node sold by server OEMs, which in many cases, has been pre-configured to run the Virtual SAN + vSphere stack in a tested, certified hardware form factor. The Virtual SAN Ready Nodes include unique and optimized hardware from the OEM, and may also include software from the OEM to complement Virtual SAN + vSphere. Virtual SAN Ready Nodes are ideal as hyper-converged building blocks for larger datacenter environments with strong automation and a need to customize hardware and software configurations. Virtual SAN Ready Nodes are also prescriptive in that they provide the size, type and quantity of CPU, Memory, Network, I/O Controller, HDD and SSD combined with a certified server that is best suited to run a specific Virtual SAN workload.